According to IDC, Smartphone market grew at 42.1 percent year-over-year in second quarter of 2012. 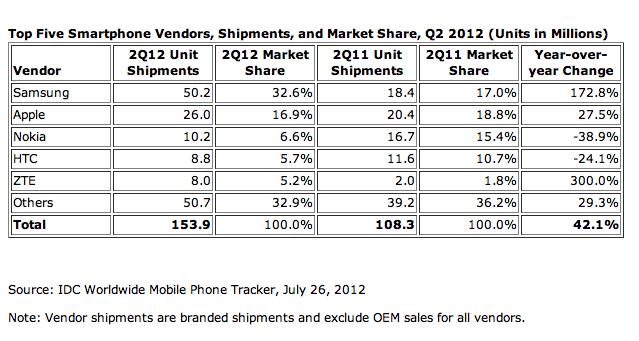 Vendors shipped 153.9 million smartphones in 2Q12 compared to 108.3 million units in 2Q11. Samsung is the leading smartphone vendor. With Samsung releasing its Galaxy S III, and buyers still waiting for the next iPhone, Samsung widened its lead in total smartphone shipments over Apple, nearly double of those of iPhone, while Apple posted an expected sequential decline last quarter. For Nokia, demand for Symbian and MeeGo units declined. Lumia sales have remained steady. HTC's performance in the Asia/Pacific region allowed it to climb back up the rank order. ZTE climbed into the smartphone Top 5 for the first time due to strength in its home market, as well as growth internationally, including in the U.S. where it is shipping under both its own and carrier brands. 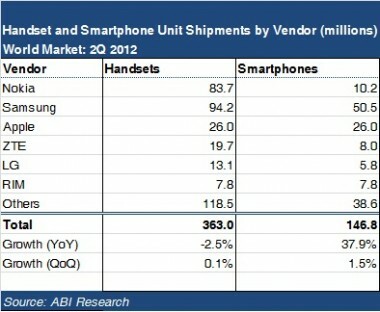 According to ABI, RIM saw its smartphone shipments down 14 percent sequentially, but it still had 7.8 millions shipment in 2Q12.